For today’s Flashback Friday, I wanted to share a recipe I have been making since 2008. 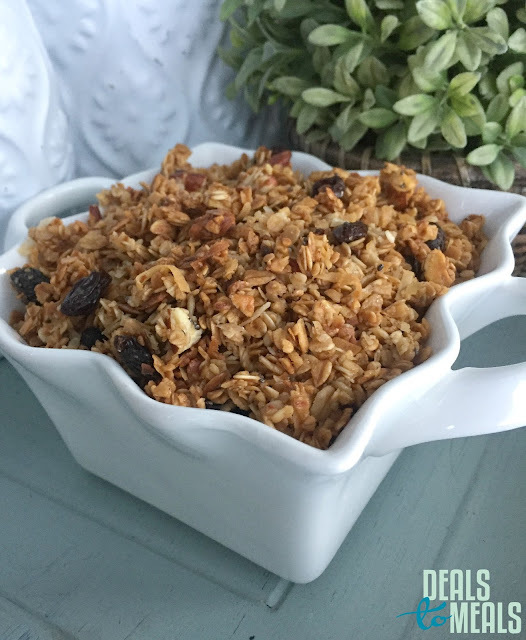 I have made many different versions of granola over the years, but this is my basic, simple recipe. It’s just the classic perfection of homemade granola. Don’t spend money on store bought granola filled with preservatives and saturated fats. I hope you love this one as much as we do! Place all of the dry ingredients together in a mixing bowl and mix together. In a microwave safe bowl, add together the maple syrup, honey and canola oil. Microwave for 30 seconds-60 seconds until soft. Whisk together and then pour over the dry ingredients. Toss until all of the dry ingredients are coated. If there isn't enough sauce, add a little more honey. If it's too wet, add a little more oats. Place granola on a baking sheet (don't spray) and put in the oven at 150-170 degrees and bake for 1-2 hours (or until COMPLETELY dry and crunchy). Every 30-40 minutes take the granola out of the oven and stir around to make sure all of the granola is evenly cooked. Let granola cool and then store in ziploc bags, Tupperwares or canisters. Granola will last for several months in your pantry (as long as it is completely dry).